Glasgow is one of Europe's most exciting destinations, combining the energy and sophistication of a great international city with some of Scotland's most spectacular scenery. All the locks are manned by Canal staff so a very easy route. The Forth & Clyde Canal is much wider than the average English canal. British Waterways staff currently operate all of the locks and bridges and boaters are not allowed to operate the locks themselves, although help is happily accepted. Between Falkirk and Glasgow there are 4 locks and 3 road bridges. 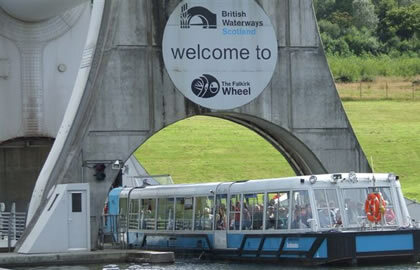 Get to the marina by about 1.30pm so that you will get the 1st 4 locks done on the Forth and Clyde Canal before the evening, the British waterways staff will see you through Bonnybridge road lift bridge and locks 17 to 20. You therefore need to contact British Waterways (0845 676 6000) about a week before leaving home to let them know your plans. At lock 20 let the British Waterways staff know where you intend to stop for the night, what time you plan to leave the following morning and how far you intend to go that day. The locks are well spaced out so boaters can enjoy some of the finest views on offer with sizable hills, moorland and woodland providing a very quiet backdrop to savour . You are then on the summit reach with no more locks between here and Glasgow, but there are two more bridges. At Kirkintilloch it is an ideal place to stock up on provisions before the final section on the run to Glasgow, the canal passes directly through the centre of town which gives easy access to all its amenities. The canal travels adjacent to the Possil Loch Nature Reserve as it keeps the sprawl of Glasgow to the south, and it is easy to relax and absorb the beauty of the surrounding lowlands and the profusion of nature within sight and earshot of the canal. To go into Glasgow you need to take the left fork when the canal splits at Stockingfield Junction. Down the Glasgow branch you can either moor at British Waterways headquarters at Applecross Street or if you are going to arrive before 5.00pm you can go down to Spiers Wharf. However, you need to have phoned 0845 676 6000 at least an hour in advance to get the Bascule Bridge opened for you at Applecross Street. If you are going beyond Glasgow to Bowling you need to contact British Waterways (0845 6766000) the day before you plan to make this passage.